In the twenty-first century, the concept of the global sixties has prompted multiple approaches that expand the timeframes and geographies of the protests that took place around the world during that decade. Several have pointed out that the events of 1968 in some countries were actually part of a cycle that spanned a much longer timeframe. Others have emphasized that the geographies of these mobilizations cannot be reduced to central countries. When it comes to historical evocation and public discussion, however, in Europe and in the Americas May 1968 is still seen as the starting point. Paradoxically enough, in recalling that moment several activists, at least in the Southern Cone of Latin America, are quick to distance themselves from it. They see the French May protests as just another event among many, an event, moreover, that was certainly not a main reference for the movements that unfolded in places like Mexico, Uruguay, and Brazil in 1968, and Argentina, Colombia, Chile, and Peru in the following years. It is not clear why, in our global historical memory, that date epitomizes a process that transcends it and did not actually revolve around it. It could be argued that it is because France had played a major role in the revolutionary processes of the eighteenth and nineteenth centuries in the Atlantic world. However, it seems quite evident that the place occupied by the French experience in the sixties cannot be considered comparable to its role in previous centuries. During that decade, Latin America witnessed major social, political, and cultural mobilizations that spawned several historical processes still ongoing today. Students were leading social actors in those movements. The modernization processes that resulted in the expansion of enrolment in secondary schools and higher education, among other improvements, boosted a student activism that already had a tradition in Latin American politics. This mobilization was conducted in dialogue with rural laborers, with whom students participated in several social development projects furthered by universities and in some cases Catholic movements. These students also joined urban workers protesting in city streets against the erosion of social rights that had been gained through populist and social reformist programs during the fifties. It was in that interaction among different sectors, and as a result of the tensions with reformist and populist projects, as well as with the traditional left, that ideas emerged in the fields of culture and politics that could be associated with the new global left, even in its countercultural dimension. That coming together of students, middle sectors, and workers in the mobilization of the late sixties gave these movements a profound uniqueness that cannot be reduced to the mere influence of what was happening in Europe or the United States. On the contrary, I would argue that certain processes actually moved in the opposite direction to what is historically recalled today with respect to that period. This article describes some movements that were constructed in the regional dialogue of the Latin American sixties but which also had a global projection. With these examples I hope to contribute to conceiving a geography of the sixties that not only expands its territoriality but also recognizes the multiple epicenters of that decade. The years 1966 and 1967 are associated with three events that had the Cuban Revolution as their starting point and which had a major impact at the global level. 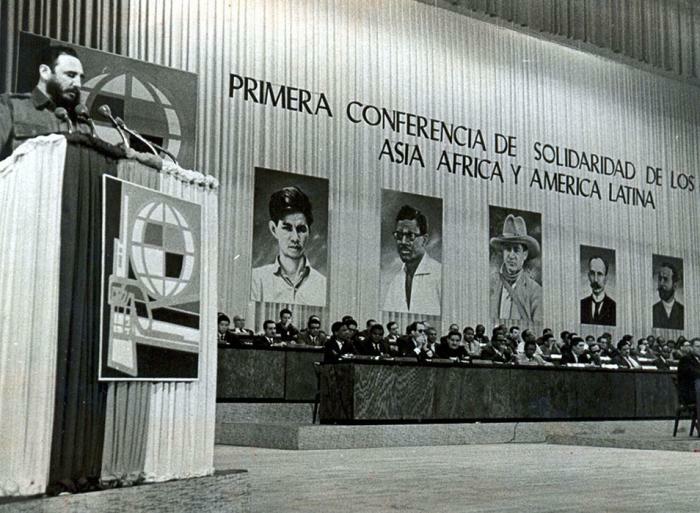 The celebration of the Tricontinental Conference, with the reformulation of the concept of the Third World in connection with the idea of national liberation revolution and socialism, the OLAS (Latin American Organization for Solidarity) Conference, with its declaration regarding the inevitability of armed struggle in all of Latin America, and Ernesto “Che” Guevara’s campaign in Bolivia were events that would have deep implications for the continent and the world. Guevara’s message to the Tricontinental, made shortly before his death, encapsulates much of that vision, which had far-reaching global repercussions. This political testament defined a geopolitics of world conflict in which the East/West tension, and even the conflicts within the communist world, would take a backseat to the North/South tension, which was more important under this interpretation. It is to this global (North/South) conflict, whose main goal was to defeat U.S. imperialism, that the revolutionaries in the First World owed their solidarity in the context of a global war. Moreover, the association between Guevara’s document and his heroic death contributed to develop a concept of leftwing militant activism connected with the idea of war, sacrifice, and voluntarism that would have a strong influence in various regions of the world. One of the images most widely circulated in streets around the world in 1968 was that of Guevara’s. More than any other aspect, his image was perhaps the symbol that most protesters identified with. Understanding the reasons for that would enable a more accurate reconstruction of the place that Latin America had in the political imagination of the sixties. In 1968, bishops from across Latin America gathered in Medellin. Although the events in the Catholic Church during this time would appear to be unconnected with what is commonly associated with the sixties, what happened there has much to do with the spirit of the Latin American sixties. In the framework of the process of renovation in the Catholic Church triggered by the Second Vatican Council, the Medellin Conference marked a turning point in Catholic thought in the region. This was connected with the “preferential option for the poor” and what theologian Gustavo Gutiérrez would conceptualize as Liberation Theology in 1972. This religious movement was linked to the process of social and political radicalization of Catholics, which in some cases drew on their commitment to socialism and armed struggle. The priest and founder of Colombian sociology, Camilo Torres, who in the early 1960s abandoned the developmentalist approach to embrace the revolutionary goals of the National Liberation Army and died in combat in 1966, became a symbol for Catholic activists throughout the region. It was in that context that theological reflection was influenced by these processes, incorporating elements from the social sciences and redefining the mission of the Catholic Church with respect to the poor and the commitment to social change. This theology, which for some is the first theology developed outside Europe in the history of Catholicism, had a major impact in the emergence of a Third World ecumenical movement, and also prompted the renovation of theological proposals in places as diverse as India, South Korea, and Africa. In the late sixties, Santiago became a hub for the development of social sciences in Latin America. The process of university reform in Chile, the establishment of regional research centers, such as ECLAC and FLACSO, and the arrival of academics from Brazil, Argentina, and other countries in the region, who were fleeing dictatorships, spurred stimulating discussions that, among other things, gave way to what came to be known as the dependency theory. This new current of economic and social thought questioned the modernizing and developmentalist approaches and posited that the development and growth of central countries were inextricably linked to the underdevelopment of the countries of the periphery. It was thus necessary to break those dependency ties to ensure the conditions for development in this region of the world. These approaches opened up new paths and languages for thinking about the issue of development and liberation in other parts of the Third World, as well as providing significant contributions for anyone interested in studying the history of capitalism from a global perspective. In addition to the political impact of the Cuban Revolution, there were other political experiences that had a global and continental projection. In the late sixties, the concept of urban guerrilla tactics as a new repertoire of collective action that was better suited for more urbanized societies with larger middle classes in the Southern Cone of Latin America began to question the rural foquismo strategy furthered by Cuba. In Montevideo, the Uruguayan Tupamaro guerrillas developed an urban strategy that was soon legitimized as a new method of struggle, including by Regis Debray himself. This renovation of the repertoire of actions influenced the development of new guerrilla organizations in South America, as well as armed groups in Europe and the United States. But political radicalization did not just foster political projects connected with violence. Perhaps the most radical project, because of its transformative potential and conceptual plurality, was the one implemented in Chile and it involved the peaceful transition to socialism proposed by Salvador Allende. His government coalition, Unidad Popular, was also the result of the meeting of the old socialist and communist left with the new actors that emerged from the radicalization of Catholics and others who were close to armed struggle and became engaged in political activities. Unidad Popular’s proposal entailed breaking the myths of the Cold War and incorporating the best of two worlds: socialism and liberal democracy. Henry Kissinger was keenly aware of this from the very beginning and that is why he took such brutal action against that experience. He was afraid that its influence would spread not only across the Americas but also in Western Europe, in countries such as Italy and France. The Cuban Revolution, Che Guevara, the Liberation Theology, the dependency theory, urban guerrilla warfare, and the peaceful transition to socialism are not just some of the most relevant aspects of the Latin American sixties; they are also ideas and projects that circulated globally and influenced political and social processes elsewhere in the world. Understanding how these ideas were received and reinterpreted in other regions would be a good way to reconstruct the complexity and the multiple epicenters of the geographies of the turbulent sixties. One of the most salient aspects of the global sixties was the inversion of the Cold War order. Among other things, because that inversion impacted the place that “Third World” actors had in much of the global intellectual debates, both political and artistic, in which they had an unprecedentedly leading role. In this sense, it is not unreasonable to posit that Latin America was one of the centers that contributed to those global debates.